I really enjoyed this fun, imaginative book! It's a story anyone could enjoy, and a quick read that you won't want to put down. The story explores friendship, romance, philosophy, and religion, as it follows three friends who themselves follow the clues on a whirlwind journey across famous religious sites across Europe and the Middle East on a search to help an old friend. You can imagine yourself riding along with them and experiencing the thrill of their journey of discovery and wild encounters with the unexpected (and dark) forces trying to prevent their success! A great fun, little book, that deserves a follow-up...and hints at one to come! Amazing story with exotic locations and supernatural elements. I could not put this book down! If you are a fan of the world's sacred sites and are interested in the paranormal, then this book is for you. Excellent. Very thought-provoking, yet a well-written, quick read. I passed it on to my teenage daughters, who both read it, as well. This would be a great short story series! The Redeemer was intriguing, suspenseful & full of action. The characters are funny, intelligent and full of sarcasm. I loved that it was informative but not too technical. You learn about places without a serious history lesson, whether fact or fiction? I read this book in less than 4 hours and would read it again. I am hoping that the author will have the sequel out soon! I will recommend this book to all my friends! A really good read! Smart, fast paced and funny, the interaction between the friends rings true. This would make a GREAT movie! Awesome easy read book that keeps you on the edge! Definitely recommend and loved reading it! 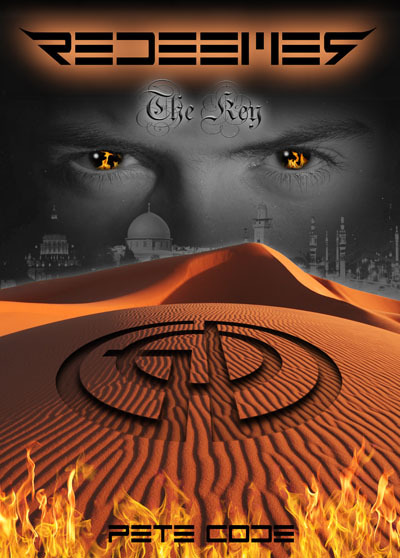 A lawyer, inventor and archaeologist are compelled to find the ancient Key to Hell to rescue an old friend. The quest plunges the trio into a myriad of supernatural and dangerous encounters at sacred locations around the world, yielding unexpected consequences. This novella was adapted from a screenplay written by Mark Litton, Pete Code, and Dan Hubp (2012), and is based on a story created and developed by Gerhard Grassl and Pete Code (2007-2015). Portions of this book were translated into English from sections written in German by Bettina Barth-Wehrenalp (2013). Two long-time friends, GERHARD, a successful Austrian lawyer, and PETE, a troubled American inventor, are on a late night call between Vienna and Los Angeles. Strange and disturbing noises interfere with their conversation. What sounds like a distorted, eerie voice turns out to be their friend, BRYAN, trying desperately to contact them. The only problem - Bryan died 20 years ago and he is pleading for them to come save him - from Hell. Reluctantly, Gerhard and Pete join forces with Bryan's ex-girlfriend, EVA, a theological archeologist and historian - only to realize they have to find the long-lost and ancient Key to Hell to rescue Bryan. Fragments of the Key are hidden in St. Peter's Basilica in the Vatican, the Dome of the Rock in Jerusalem and the Holy Mosque in Mecca. Despite being pursued by sinister creatures from the underworld determined to stop them, the trio embarks on a dangerous, action-packed, international quest to infiltrate the Holy sites. Consequently, unexplained and dramatic events at these sacred locations generate worldwide attention and trigger the unprecedented cooperation of the major world religions to work toward mutual tolerance - and worldwide peace ensues amongst their followers. Please enter the following information and click the SEND MESSAGE button below.